A hitherto unrecorded copy of that most important book for Shakespeareans, the First Folio, has been discovered in Saint-Omer, a small town near Calais in northern France. The ISE is proud to have facsimiles of two copies available on our site, one from the State Library of New South Wales, one from Brandeis University. The newly-discovered copy is incomplete, lacking about 30 pages, including the prefatory materials with the well-known image of Shakespeare on the title page. Probably for this reason, the Folio had been mis-catalogued as an edition from the eighteenth century, until a researcher, Rémy Cordonnier, came across it. Cordonnier immediately suspected that it was older, and sought help in identifying it; by good fortune Eric Rasmussen, foremost expert in the field and the General Textual Editor of the ISE, was in London. The Shakespeare Thefts: In Search of the First Folios. New York and London: Palgrave Macmillan, 2011. 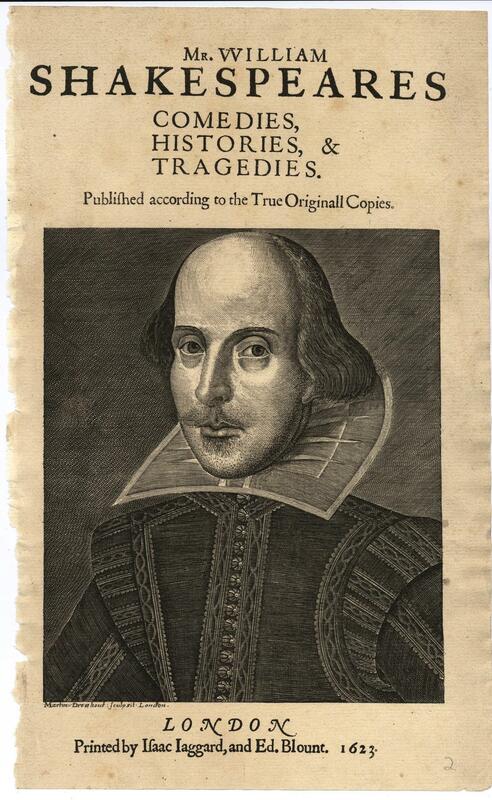 The Shakespeare First Folios: A Descriptive Catalogue, with Anthony James West. London: Palgrave Macmillan, 2012. I get about a dozen inquiries each year from librarians and individuals who think they might have a First Folio. Before last week, these have all turned out to be facsimiles of the First Folio that were created in the early days of photography, when the publishers were so pleased by the authenticity of their reproductions that they didn’t want to mar them by providing any information that would alert the user that the text in their hands was a facsimile, so it’s understandable that folks continue to be misled by these. However, when Remy told me that the book in question was missing the last three pages of Cymbeline, several pages throughout, and an entire play (Two Gents), it struck me that such wear ‘n tear is what happens to 400-year-old books – it’s not what happens to 19th-century facsimiles – so we might indeed have a first folio here, as indeed we did! The copy is annotated in what seems to be handwriting from the period. Rasmussen comments that a point of particular interest in the copy is that Henry IV may have been performed by a group using the Folio, since the names of the role “hostess” has been changed to “host,” and “wench” to “fellow” – possibly reflecting an early performance where a female character was refigured as a male. Why might the book have come to Saint-Omer in the first place? The library was originally part of a college established in 1593 by an English Jesuit to educate English Catholics. Much has been written about the degree to which Shakespeare was or was not an adherent to Catholic doctrine; the present discovery will tell us little about that issue, but it may reveal quite a lot about the way his works were received by Catholic readers. In her New York Times piece, Schuessler quotes Jean-Christophe Mayer, a Shakespeare expert at the University of Montpellier III in France, who noted that a library in the northern French town of Douai also owned some early transcripts of Shakespeare’s plays. The First Folio is not the rarest book the St.-Omer library owns. It also has a Gutenberg Bible, of which fewer than 50 are known to survive, while the number of Folios stands at about 233, from an original print run of about 800.